Meg Macy is an award-winning author and artist. She writes several genres, sometimes blended, using different pseudonyms. She is one-half of the writing team of D.E. Ireland, authors of the Eliza and Henry Higgins Mystery series (St. Martin/Minotaur), the first of which, Wouldn't It Be Deadly, was nominated for a 2014 Agatha Award. Her first book, Double Crossing (writing as Meg Mims), won the 2012 Spur Award for Best First Novel from the Western Writers of America and was named a Finalist in the Best Books of 2012 from USA Book News for Fiction: Western. Two of her contemporary romance novellas were Amazon Kindle bestsellers. Born and raised in Michigan, Meg lives with her husband, a “Make My Day” white Malti-poo, and a rescue Lhasa Apso. Her artistic work is in watercolor, acrylic, and pen/ink media. She loves classic movies, cartoon strips, clocks, and cookies. 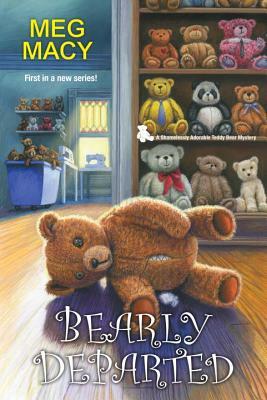 Visit the author online at megmacy.com, Facebook.com/MegMacyTeddyBearCozies/, twitter.com/megmims, and pinterest.com/meg_macy.